Teaching my youngest to read is something that gives me anxiety! My oldest learned to read at school and my middle taught himself. I've never had to really be the responsible party in teaching reading but this time around with my youngest I will be. Thankfully Memoria Press sent me their First Start Reading program for review. Teachers Guide - This is a big soft bound book that includes the teacher's information for all four workbooks. At 322 pages it is very complete. Each lesson has notes for the teacher to help you with teaching your child. Book A - This book introduces children to beginning writing and reading. 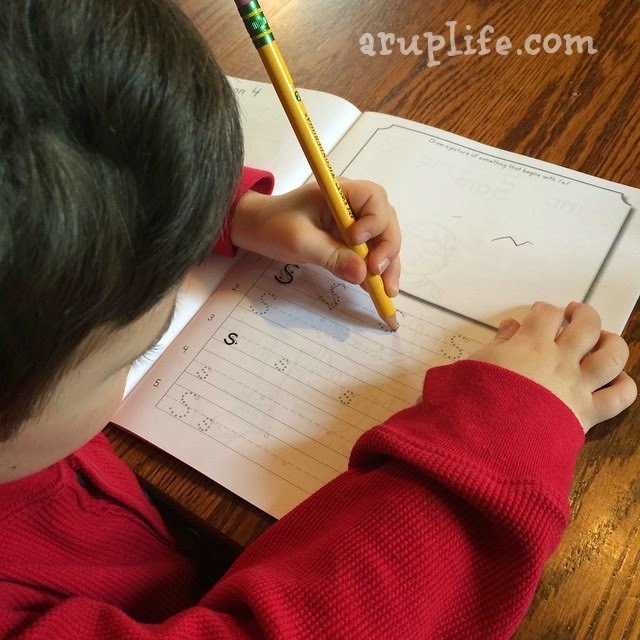 You learn letters with a pattern to connect and have reading success quite quickly. Book B - This book expands on book A but also includes dictation. Writing practice is continued. Book C - This book expands on book B. Book D - This is the last book in the set and it includes some new activities for the words you know. My adorable four year old was quite ready for a program like this. He is in speech therapy and we had been holding him off on reading to make that journey easier. However, once we received these books we dove right in. We worked on book A several times a week. He already knew his letters by sight and sound so that part was just review for him. However, in the teacher's manual you go over identifying the sounds in words at the beginning or the end... his knowledge of the letter sounds really helped him with this task. One area he struggled with was hand writing. At 4 his motor skills are not fully developed. Some days he could complete a whole page of practice letters and some times it took 2 days to work on that. Since he is 4 - that slower approach was fine with me. My main goal was that he enjoyed the learning time and had some success. I did purchase a large round pencil for writing at the advice of my sister-in-law who is a preschool teacher and I would recommend that for any one doing this set. While he struggled with handwriting he excelled in the reading part. By lesson 5 he read his first sentence! You could see the pure joy on his face when he realized he read for the first time! This is exactly the type of program as a mom I needed. It wasn't flashy - all the workbooks are in black and white - but it was thorough and easy to implement. It was something I could pick up and go with little planning. The teachers guide gave you all the information you needed. I have confidence that I will have a full reader once completing this course. This is a kindergarten course but I felt that at 4 with knowledge of letters (sight/sound) Jace was fully ready for the next step. We will take it slowly because I'm in no rush to push him. The best part about the program was how Jace responded. He was thrilled with his success both in writing and reading. He asks to do school and that is exactly what I want to see for him. He has been practicing writing on his own since we started the course and I think it is further proof that he is learning and enjoying the journey! We shelved this product for a bit of time because I was pregnant and sick and it was very hard to get going with anything at that time. Then about three months after the baby came we started again at a very slow pace. We actually completely restarted which I think helped my son to really get a firm foundation. There has been an update to the program with the edition of Book E which is intended for summer gap learning. We are really enjoying this curriculum. MP is very easy to use and very grab and go. You don't need a lot of special things just a pencil and crayons/colored pencils. I appreciate that. My son is now reading short CVC books and really doing quite well. I'm so happy we've used this program and with the results. We finished our year with First Start Reading and it was a wonderful fit for my son! You can read more about that year here. 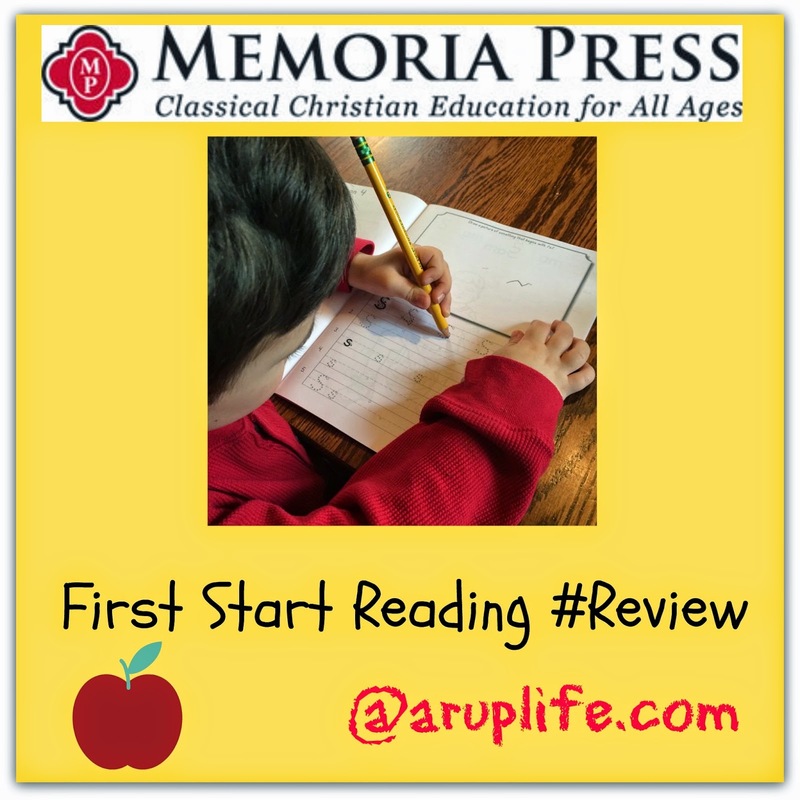 I also will be using Memoria Press as our Core for 1st grade. Click on the banner below to see what the rest of the crew is saying about Memoria Press! Great review! I'll definitely suggest this to others who will be teaching their young littles to read! Is this phonetics based? Like learning word groups vs phonics? I think maybe BJ press and All about Reading may use that type of reading instruction, too.